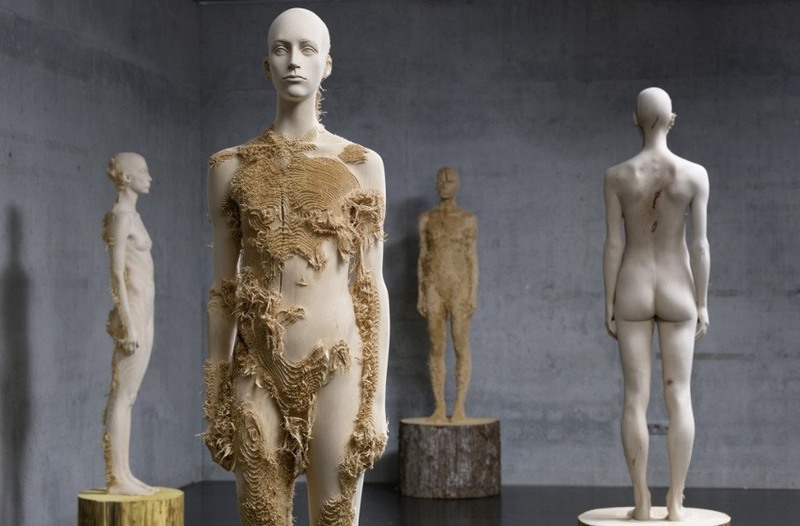 Although wooden sculpture is a medium that is often unduly neglected on the contemporary art scene, the renowned Italian artist Aron Demetz has developed unique body of work that reveals its full outstanding potential and its rich gamut of poetry. His love of wood enables him to spend the countless hours necessary to create each piece. 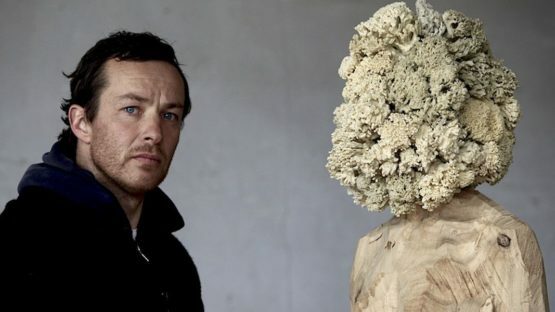 Using classical woodcarving techniques, Demetz creates life size figures which emphasize the relationship between man and his environment avoiding the traditional opposition among them, and allowing the two to become an inseparable whole. 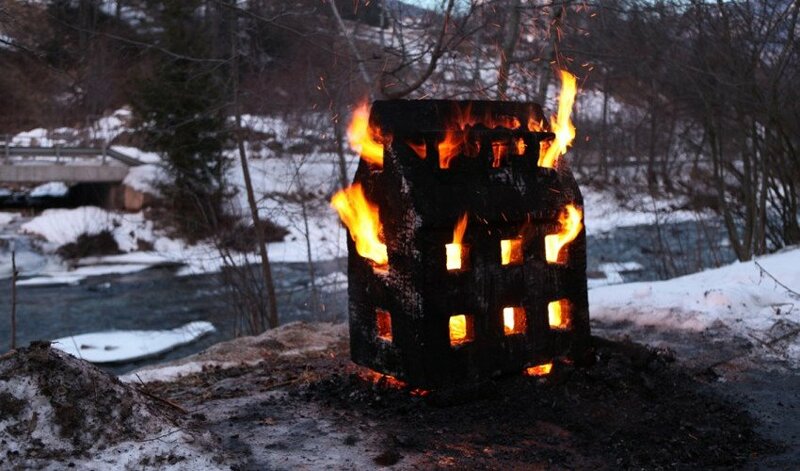 Amongst carving wood, the sculptor also explores many different ways of distressing the wood including fire, applying resin and shredding the surface of sculptures. Aron Demetz was born and raised in Gröden/Val Gardena, a valley in Northern Italy that has been known as woodcarving area since the 17th century. During that period, Italian woodcarvers became enthralled in the art of making wonderful carvings for everyday use, but after a while, they began creating wide range of often detailed and delicate figurines. By the 18th century, Val Gardena became a major center of woodcarving, primarily thanks to pedlars and merchants who carried the carvings and the name of Val Gardena far and wide. Within the youngest generation of wood sculptors hailing from South Tyrol, Demetz is considered to be one of the most innovative protagonists who dares to go beyond the boundaries of traditional craft. In his practice, Demetz doesn’t focus on the pure shape of his figures, but rather the different process in which the medium is treated and how each part of its composition and decomposition reflects on the figure itself. 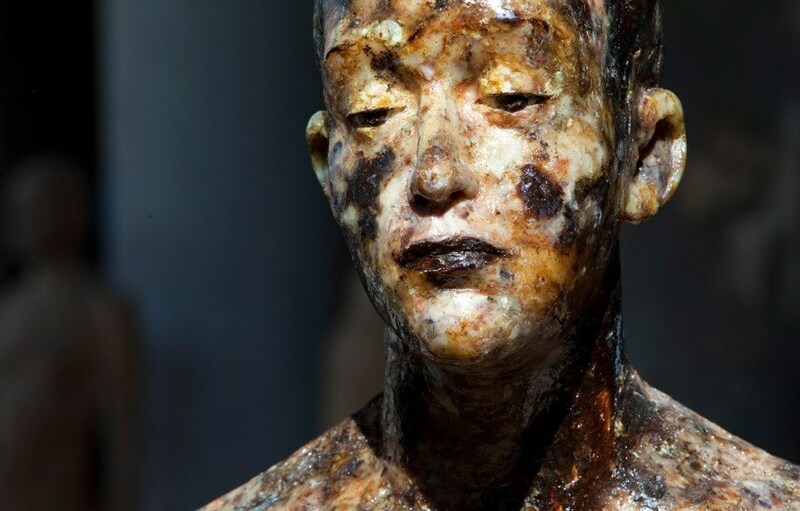 His large scale sculptures range from raw almost unfinished woodcarvings, to burnt remnants of what once was of his subject like Tragedia dell’ Univocitá, 2011. His pieces highlight the harmony and conflict that exist between man and nature, as well as the vulnerability of both. In Demetz’s latest series of works titled Advanced Minorities, the naked, smoothly carved figures with parts of stunning textured features, are frozen in peculiar postures or in poses of the antique portraiture. His oeuvre deeply engages the observers on the psychological and emotional levels, revealing both our coexistence with the natural world and our alienation from it. Demetz has achieved international recognition for his sculptures, with his exhibition in the Italian pavilion at the 53th Venice Biennale. In the piece Untitled, conceived for the Venice Biennale, the sculptor introduced the use of natural resin, meticulously collected from the woods in the forests of his naïve town. His sculptures are in important collections including Museo Trauttmansdorff, Merano; Museo Omero, Ancona; Museo Ladin San Martin De Tor, Bolzano; and Palazzo Madama, Rome. He has exhibited his works in individual and collective shows in galleries throughout the world. His recent solo shows include AraCor o l Eco Della Cenere at Terreno Baldío Arte, Mexico City and Keimzeit at Barbara Paci Galleria d’Arte, Pietrasanta, Italy. The sculptor is represented by Gazelli Art House in London, UK. Aron Demetz lives and works in Gröden/Val Gardena in South Tyrol.